This abandoned Civil War fortress is slowly being swallowed by the waters of Lake Borgne. 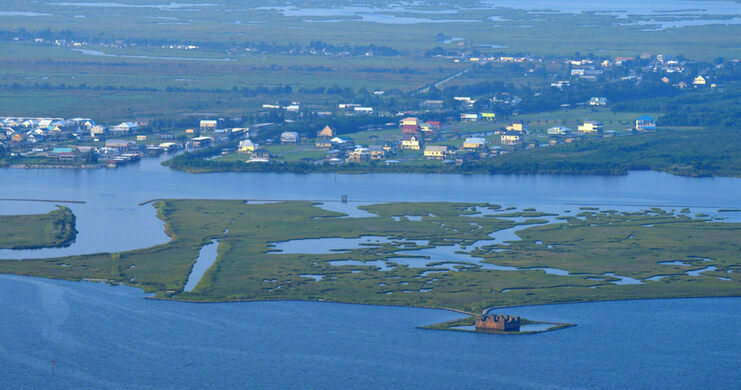 Looking like the remains of some lost kingdom, the castle-like Fort Proctor in St. Bernard Parish, Louisiana rises up out of the shallow waters of Lake Borgne, actually dating back only to between the War of 1812 and the Civil War. But rather than being a base that was abandoned after being routed, this stronghold was never even used. An impressive collection of dollhouses and an homage to the frog-leg canning industry. The fort was intended to be part of the fortifications protecting water routes towards New Orleans. In 1814, the British Army had attacked New Orleans after their navy advanced up Lake Borgne and defeated a small flotilla of gunboats belonging to the New Orleans Squadron of the U.S. Navy, in the Battle of Lake Borgne. Before the Civil War, Fort Proctor was constructed to protect the strategically crucial waterways surrounding New Orleans. Shortly after it was completed, a hurricane damaged the structure and before it could be repaired and put back into use, the Civil War erupted, diverting attention from the site. By the time anyone had the time and energy to put the fort back into use, it was obsolete and simply left to rot. Although it originally lay on a parcel of land near the city of Chalmette, the inexorable creep of the coastal erosion which threatens the entire region has seen the fort slowly become engulfed by Lake Borgne. It is now reachable only by kayak or small boat, whereas only decades ago it was a convenient destination for restless teenagers. Visitors may paddle into the fort and observe the collapsed iron beams and submerged foundations which serve as a testament to the fragile existence the region’s populace share with their natural environment. Fort Proctor may be accessed from the nearby fishing destination of Shell Beach outside of Chalmette. It is fairly visible from the beach, and is only a roughly twenty minute paddle. Divers can encounter an abandoned warship encircled by a giant kraken submerged in the British Virgin Islands. This remote fort on the Yukon River is a vestige of the wild Alaska gold rush. This pink watchtower served as the seat of the Greek government after independence from the Turks. The mile-long pier stretches from a ruined fortress out into the Baltic.